While most people have their lives already figured out, some might still be quite confused as to what their purpose in this world is. Times like this make us stop to think and assess ourselves. Self-assessment is, in the simplest sense, looking at yourself and assessing who you are, what you want to do, and what you can do with your own life. Schools help in solving this problem through student assessment. Educators evaluate each student’s knowledge and skill through academic and extra curricular activities. Such activities will determine each student’s skills, strengths and weaknesses in different areas. Thus, they always encourage the students’ participation in activities inside and outside of the classroom. Each person has his/her own personal interests, skills and attributes that makes him/her fit for a certain job or career. However, some people end up wanting to start a career on something which does not fit with their writing skills. 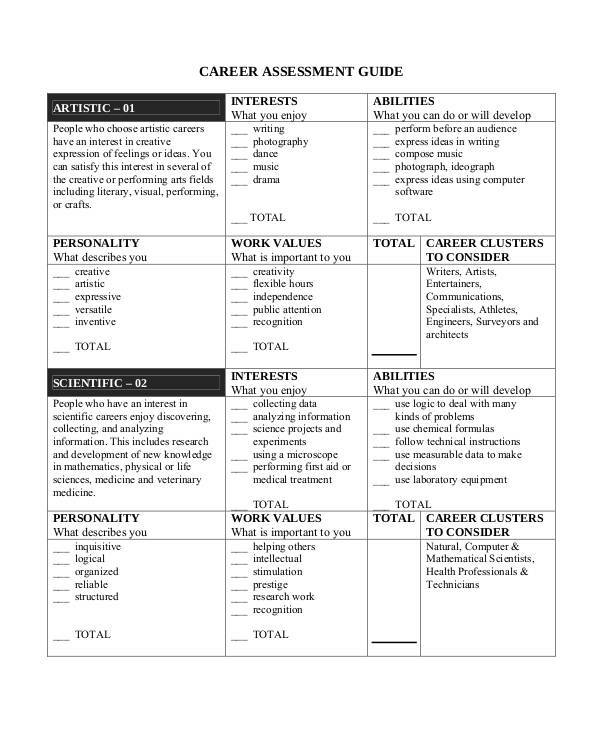 Knowing this, schools conduct career assessments which guide students in deciding what career fits their skills best. 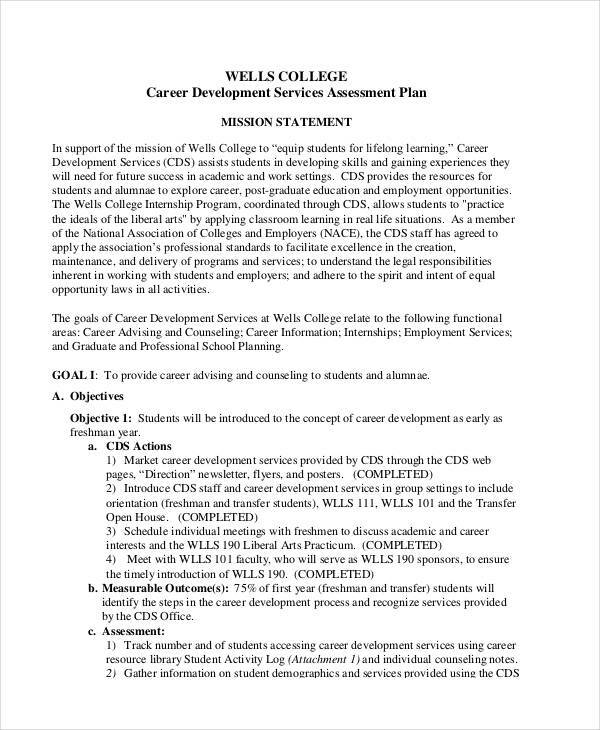 In most cases, career assessments are conducted either by a series of written questionnaires or survey usually devised by career service centers, or by a career or guidance counselor. This differs entirely from a risk assessment in which the main purpose is to identify potential risks, hazards in an area or workplace. Say you just started establishing your career, and there are many things you want to do at the same time, or you do not have a particular career of interest but you really want to do something out of your life. 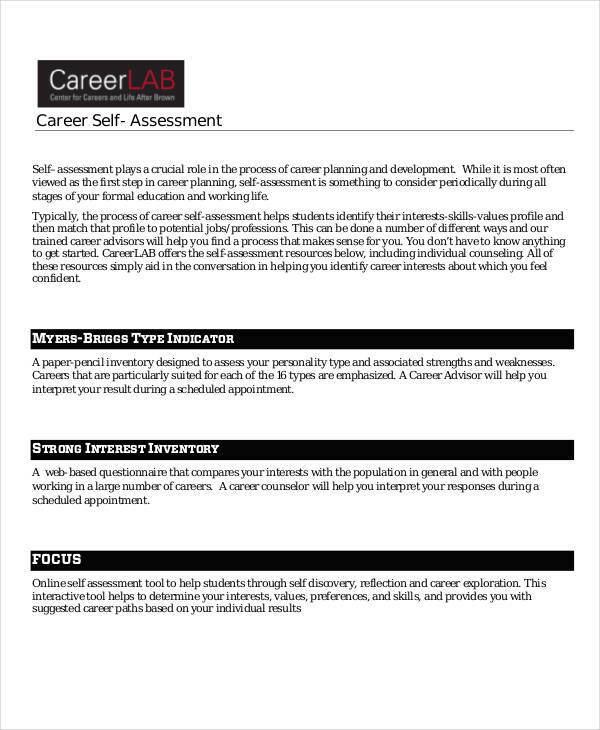 Career assessments are created to help people like yourself decide on the best career to pursue. 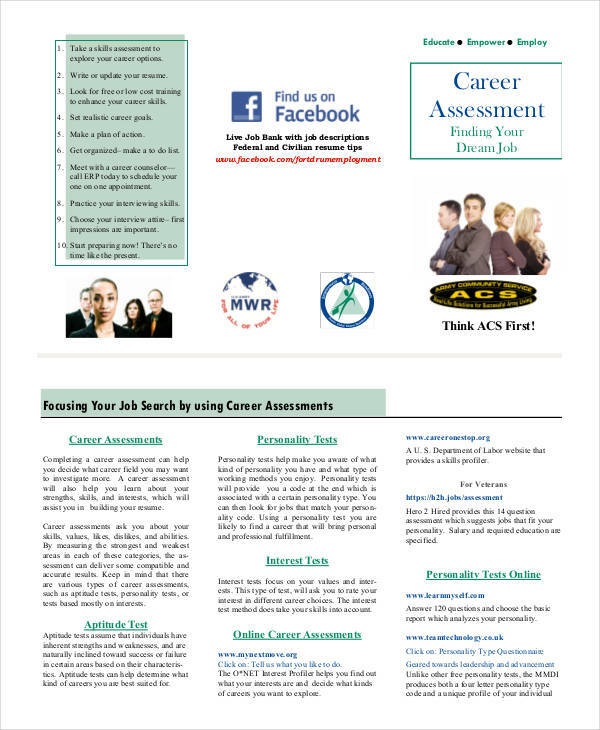 Career assessments show you what qualities you possess that makes you fit for a certain job or career. 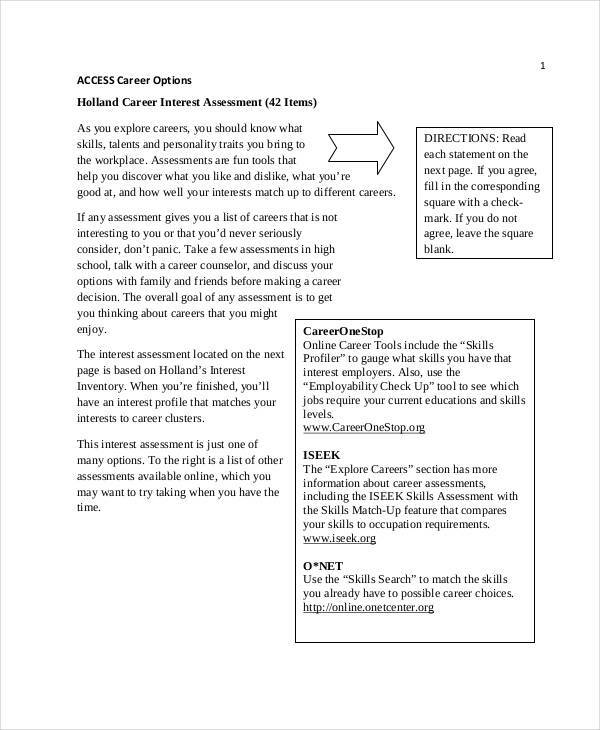 The area in which you get the highest score determines your best attribute and your best career options. Writing is never easy. 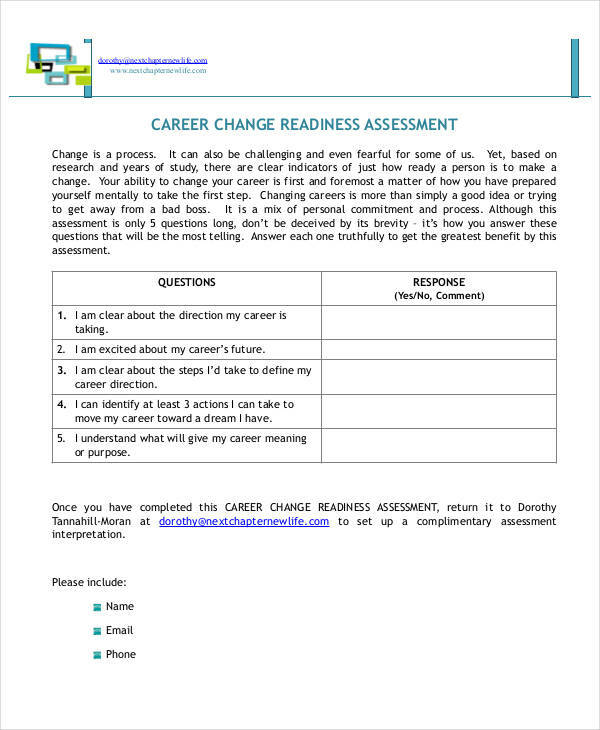 Answering a career assessment is difficult.Writing a career assessment is even more difficult. But, this may be better than doing nothing at all. 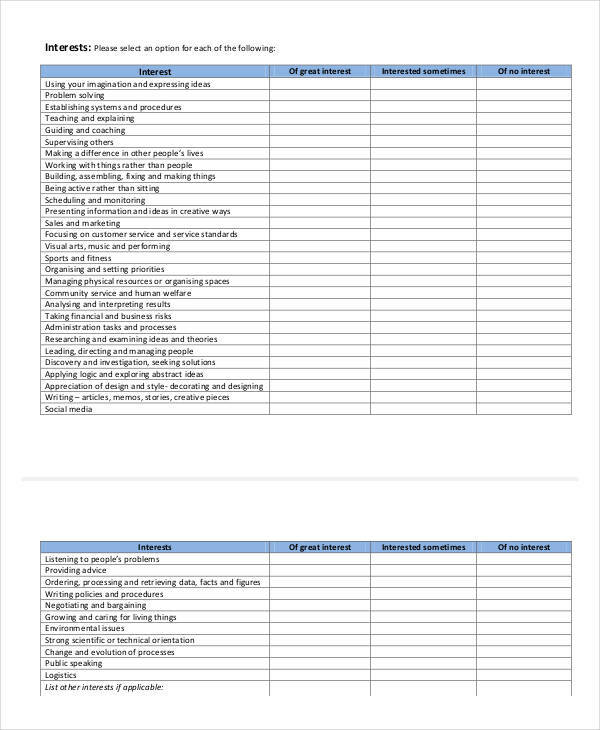 Still, if you do not want to write, you may want to download some free assessment examples in PDF format found in this article. And for those who want to try, here are a few tips which, I hope, will be of help to you. Identify the factors. In choosing any career, there are a lot of factors to take into consideration. 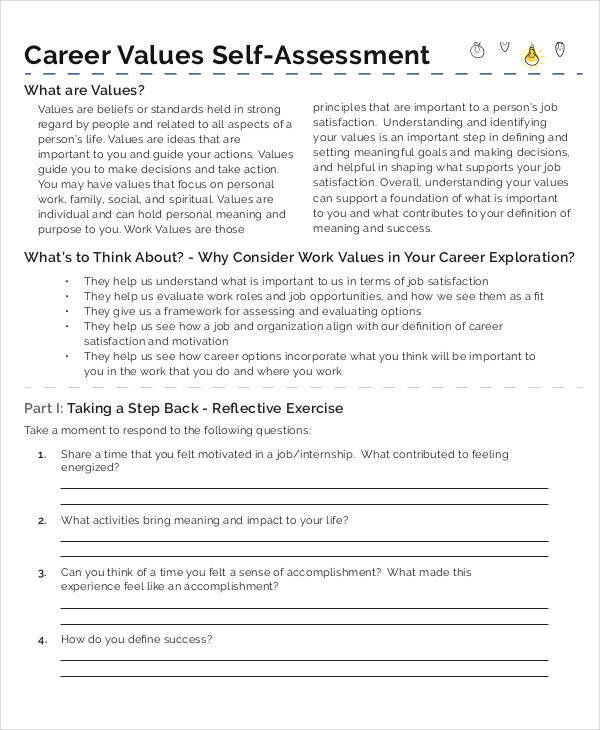 In writing a career assessment, focus on the things that matter most– skills, qualities, attributes, personality, personal interests, etc. Such factors will be able to determine whether a person fits a certain career path or not. Be clear and organized. Some people who undergo career assessments are already confused as it is. So make a clear and organized set of questionnaires and surveys which can be easily understood and answered. Set goals and objectives. 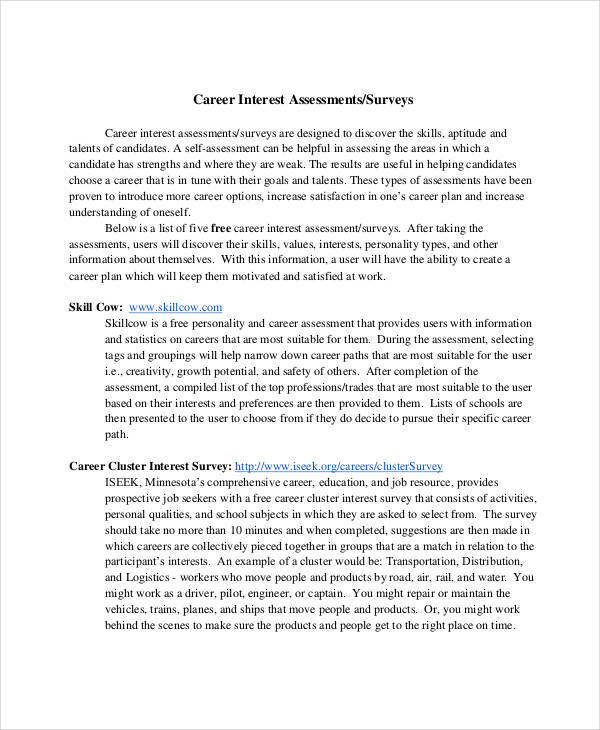 Why are you writing a career assessment? 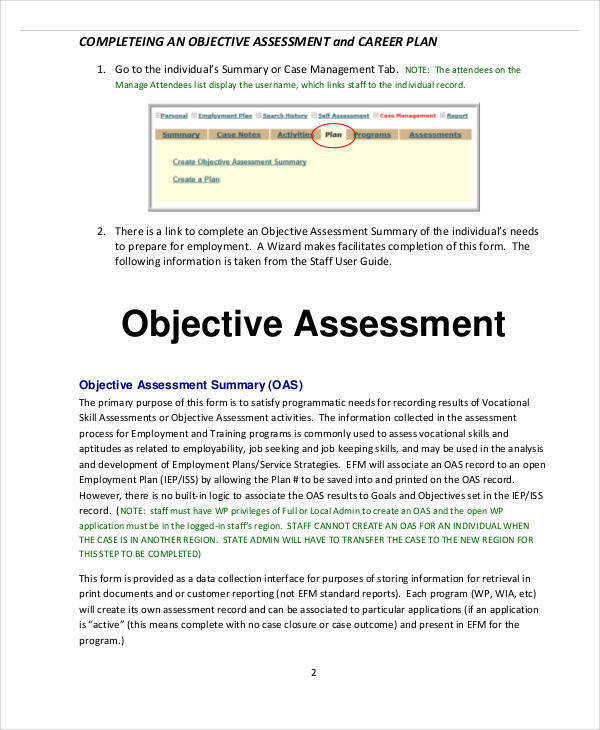 What is your goal in conducting a career assessment? Set clear goals and let the people know why you are doing what you’re doing. This way, they will know what you want to achieve in doing so. Encourage. A few words of encouragement won’t hurt. Encourage them to be honest with their answers, encourage them to self-evaluate as they go, and so on. 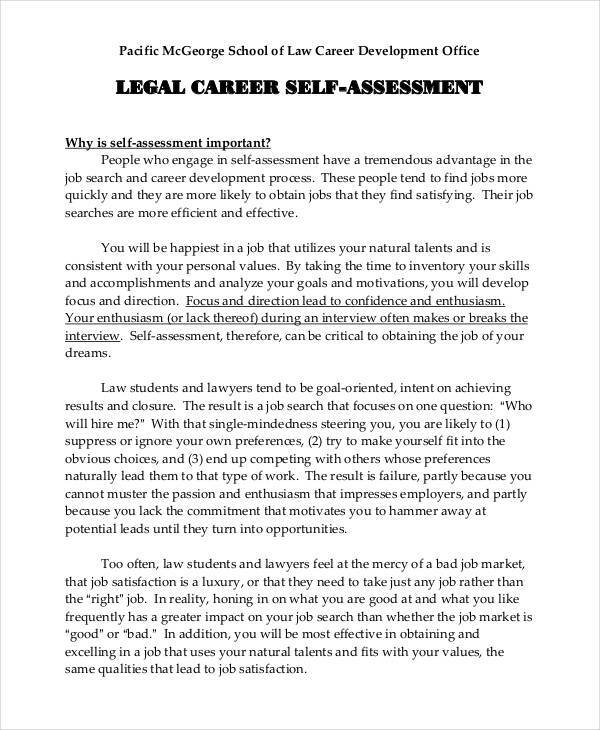 You may want to assure them that this career assessment and its results will not hurt them in any way. And of course, advise them to keep an open mind at all times. Make it interesting. Include activities to stimulate their fun side. Make sure they do not stress themselves while answering, instead enjoy themselves until the end of the assessment. In this day and age, there are so many career options to choose from, which makes it harder to choose something where we would fit well, in addition to the fact that not all of us have it all figured out. 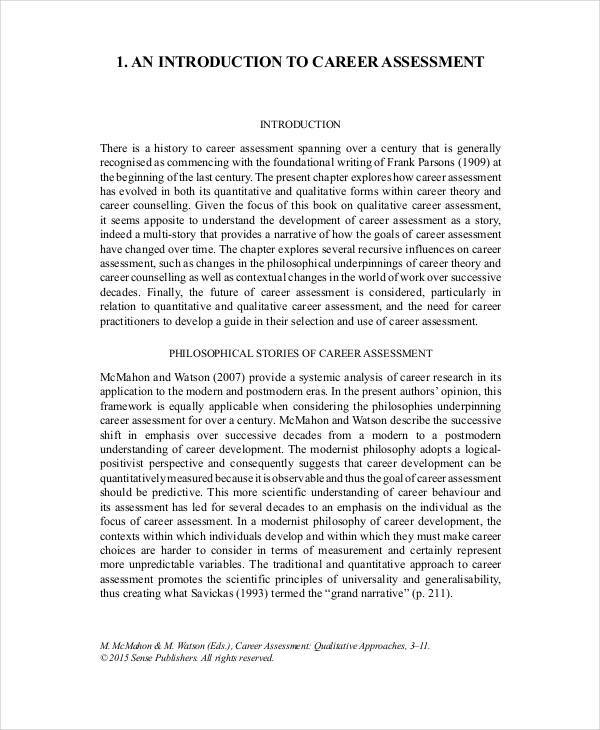 But what will we really get out of a career assessment? Career options. 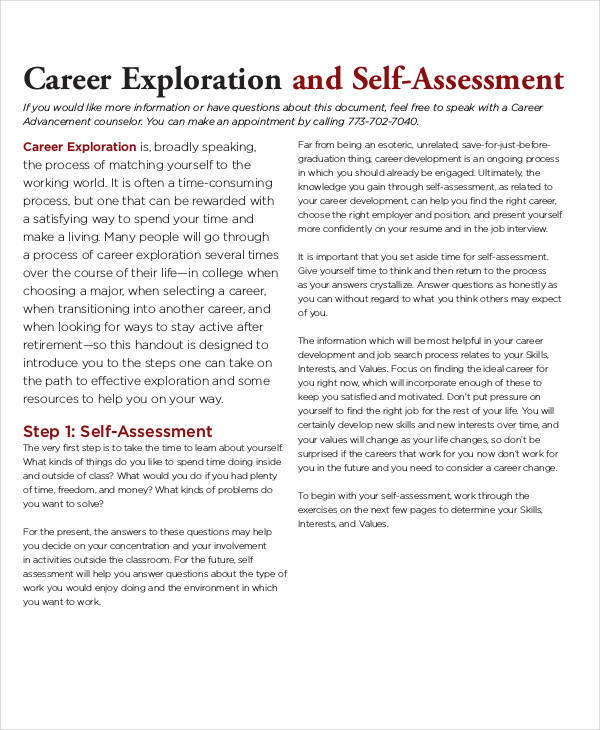 Many people believe that career assessments minimize your options from a thousand to, maybe, ten. This will save you a lot of time and effort, and of course, will help you find the best career for your skills. Strengths and weaknesses. 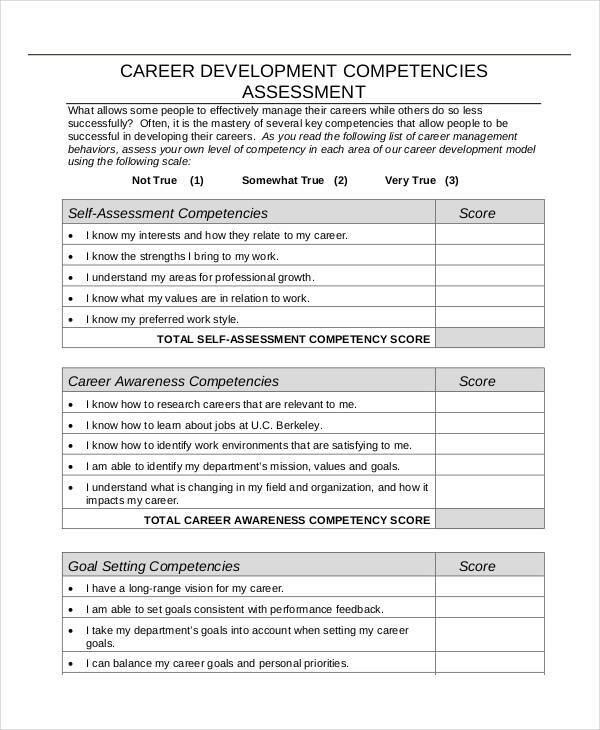 Career assessments focus on determining your strengths and weaknesses, the attributes that fit certain areas, and your best skills. Working at a job that does not fit your skills well will make you feel insecure. But knowing your strengths and weaknesses will help you know what jobs will suit your skills best and what will not. Goals. 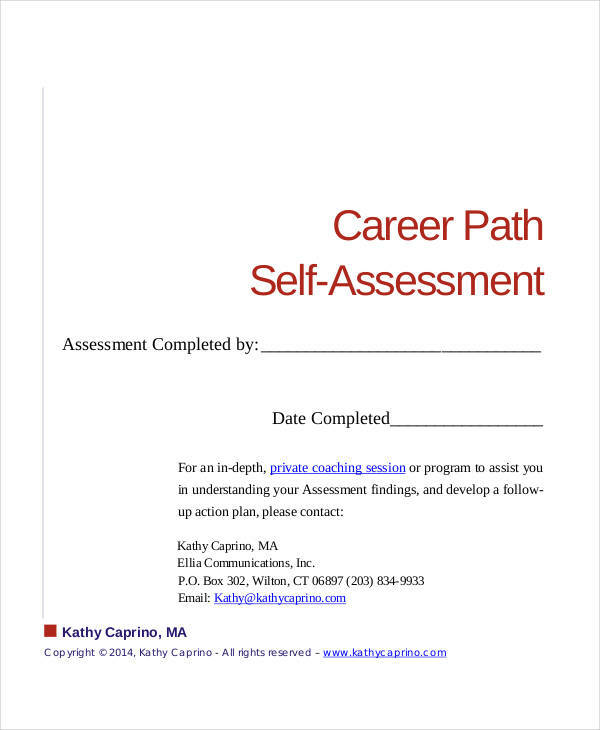 If you are not confident about your own self-assessment, career assessments will do the job for you. 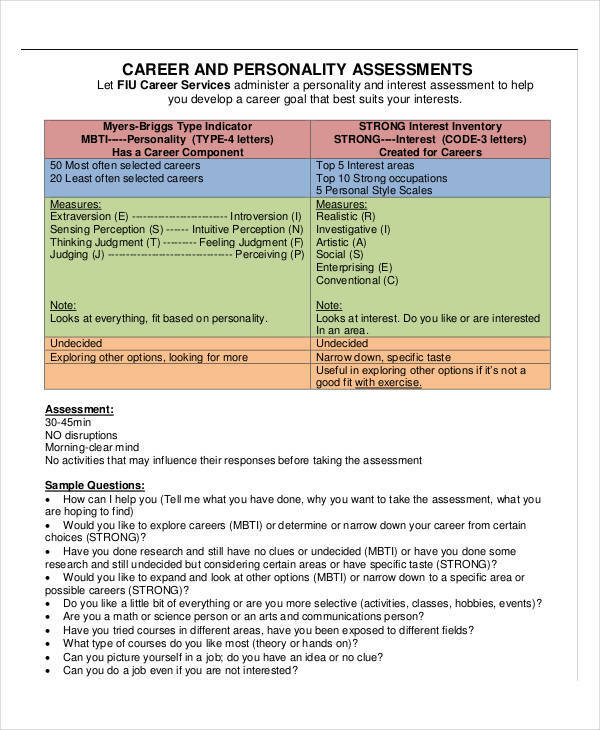 Career assessments will aid in determining what you want to do, and you may be surprised to find yourself eyeing a certain smart goal after knowing the results of your career assessment. 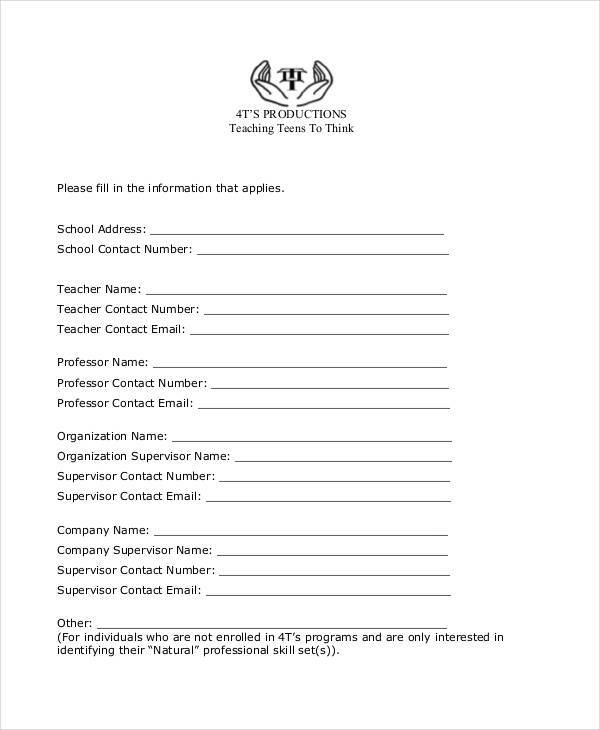 Can a Company Fire You without Giving Notice?